The new Centre of Culture and Education Krona was opened in a Norwegian city Kongsberg at the end of last year. This visually attractive building comprises a college, science centre, theatre, three cinemas with 469 seats, public library and Academic library, office rooms and a café. 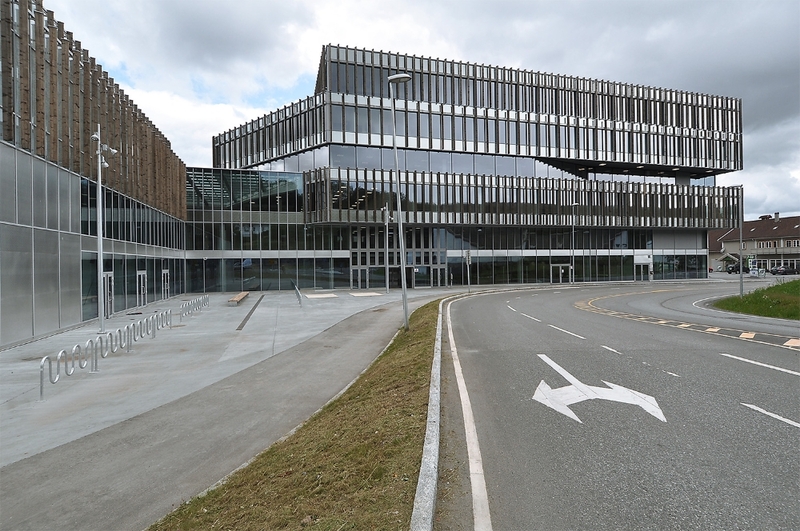 In the construction of Kongsberg Centre of Culture, UPB did the designing, production, delivery and assembly of the glass facades, and designing and assembly works of sandwich walls and blinds. Intention of the Chief Architect was to deposit metal sheets of special material and texture in the glass panes of dark glass part of the building that would visually resemble silver. Silver fields have an important role in the development of the city in history of Kongsberg – from 1623 to 1957 approx. 1,350 tons of silver were got in the city fields, approx. 4,000 workers worked in the fields during the peak times in 1770. Intention of the second architect was to put solid timber parts in the facade part of the building that would make the design of the building closer to nature. Solution for the fixing of heavy parts was developed by UPB engineers that were later assembled by UPB assemblers. The municipality has invested approx. 600 million Norwegian krones (62 million eur) in the new 24 267 m2 wide centre of culture and the construction was commenced in October 2013. The project was built within the planned deadlines and it was commissioned at the end of 2015.